From Jan. 24-27, instructors of Drum Corps International member corps and the DCI Board of Directors will meet in Orlando to consider 10 new rule proposals. DCI.org columnist Michael Boo breaks down each of the items that will be considered and gives his insight and opinions on how passage of each rule might affect the direction of the drum corps activity. Part III of this series looks at a proposal intended to prohibit the use of all electronic amplification in competition. drums to chocolate cream pie and garlic. 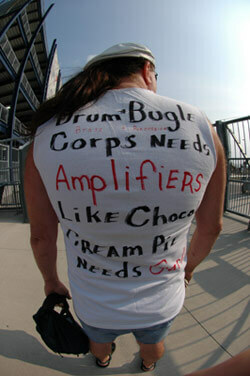 Drum corps fan Timothy Kviz submitted all three of the proposals about restricting amplification techniques in some sense. Brad Furlano, executive director of the Blue Stars, presented the three proposals, which would be implemented in 2009 if passed. Under DCI guidelines, proposals must be presented by voting members of the DCI Board of Directors. In a sense, the three proposals are somewhat contradictory, as one asks for amplification to be totally eliminated, one accepts amplification but limited to just the front ensemble percussion, and the other would require that sound boards be operated by corps members only. Without amplification, there are no sound boards, therefore, it is feasibly impossible for all three proposals to pass at the same time, as all could not be implemented simultaneously. The mere fact that these proposals are being presented at the DCI Annual Meeting & Conference Weekend is somewhat groundbreaking. These may be the first proposals ever presented with the intention of undoing prior rules that have been voted in. It also is believed that rules have never been repealed. Rules in place have given way to new rules meant to clarify or push forward the continual evolution, but never before have rules served to totally reverse pre-existing regulations. Amplification of any kind may not be used. This proposal is possibly the most drastic on the docket. Some may feel that this proposal, if implemented, would be like turning back the clock on the drum corps activity, since amplification of the front ensemble and human vocals has been allowed since the 2004 season. If this proposal were to pass, it's like ordering corps to abandon B-flat pitched horns and go back to G pitched bugles, as most (if not all) of the top competitive corps already have purchased the amplification equipment this proposal seeks to eliminate. There are some interesting points brought up in this proposal in a concise and logical manner, and it's worth a look if you haven't read through it in its entirety. There are a couple points in particular that intrigued me. Written in the proposal as justification for repealing the use of amplification on the field: "Judges, whether they will admit it or not, have struggled to deal with issues caused by amplification equipment, as evidenced by severe equipment failures and severe ensemble imbalance issues occurring when there is no tangible impact on the scores assigned." This is quite a cogent observation, as many fans have commented that performances in which amplification equipment has gone haywire still received essentially the same scores as performances where this didn't happen. The overall effect and quality of a musical presentation is to be rewarded, but currently, there is no concrete way of penalizing (for lack of a better word) a performance where the amplification betrays the performance. I believe this is largely due to judges operating on a "build-up" system rather than the old teardown "tick system," plus the fact that judges judge the members' performance and not that of the equipment. It's an interesting angle that hasn't been fully publicly addressed yet by the judging system, and will probably warrant some interesting discussion in Orlando. Also addressed in the proposal is the idea that eliminating the use of amplification will have minimal impact on the creative aspects of a corps' program noting that designers and instructors functioned with these limitations until 2004 when amplification was first introduced into the front ensemble. Show designers would certainly argue that passage of this proposal would take away some of the palette colors that can now be heard as well as eliminating the use of narration, which to them would not be a minimal impact. Keep in mind, in prior years, drum corps functioned without a lot of things; three valves on horns, dance elements in color guards, grounded front ensemble instruments and even music that diverged from the strict military music inspired dictum of 120 beats per minute. Certainly there is something to be said about how those evolutionary changes have transformed how we view drum corps performances today. One of my long-held theories is that once you give someone a new toy, you'll never get it back. That in essence is why in my opinion you would probably have to administer me oxygen if this proposal makes it all the way through the rules approval process and the allowed use of amplification is totally rescinded. Coming soon on DCI.org: Part IV looks at the second of the three proposals that deal with placing restrictions on amplification and soundboard operation. Part V will examine the four remaining proposals that deal with topics including judges, performer age limits and length of performances. Read Part I: electronic instruments. Read Part II: amped brass & water on the field.